I love Devon and Olivia's story. They were so in love when they first dated but life wasn't meant to be easy and circumstances caused them to part. They should have trusted and believed in each other, but they were young. They get a second chance when Devon reaches out to Olivia for help in saving his home town. What starts as a fake relationship quickly spirals into dangerous territory as old feelings come to the surface. Can they make it work? This story is filled with great characters and has lots of emotions. I look forward to reading more about the people of Blueberry Springs. WOW! An awesome start to a new series! Devon and Olivia meet again 10 years after their college break-up. They need each other in order to further their careers. If Devon becomes Mayor, Olivia will get what she needs for her business venture. So, she helps Devon run for Mayor. Sounds simple right? Guess again. Nothing is simple when it comes to these two.I laughed, cried, got angry...the whole gamut of emotions. But this isn't an angsty book, it's a sweet romance full of hope for the future. Full of love. All kinds of love, not just romance. That is one of the things I love about Jean Oram's books--they showcase all kinds of love and are full of hope. A feel good read.The prequel, The Promise, offers a lot of insight into Devon and Olivia's relationship. While you don't have to read it first, I recommend reading it before you read The Surprise Wedding. It will make this book so much more fulfilling. I highly recommend reading all of Jean Oram's books. She is an excellent author and never disappoints. This is my first read by Jean Oram. Her main characters, Olivia Carrington and Devon Mattson, were believable, quirky, and intertwined with humor. I wondered how a relationship that had failed ten years ago could possibly have a chance when there were so many bad memories between them.When Olivia's company needs an ingredient only found in Blueberry Springs, where Devon just happens to be running for mayor, things heat up between them. I found myself cheering Devon on for being relentless in pursuing his dream as Mayor and for Olivia determined to solve her companies issues.I loved the surprising ending which wrapped everything up nicely. This was a warm, sweet romance that leaves you with a feel good feeling.I was provided with a copy and voluntarily chose to review it. I loved the small town of Blueberry Springs. All the eccentric, nosy and loving neighbors are wonderful. They look out for each other and are willing to lend a helping hand when needed ....or when they believe it’s needed. HahahaI really liked Devon. He is such a sweet, caring and good hearted man. Seeing that his town is in trouble Devon is willing to do whatever it takes to save it. Even if that means working together with his ex. She blew his heart to smithereens years ago and he’s still trying to recover. Doing what’s in the best interest for his town will be hard but he’s not willing to just give up and let the town fall to ruin.Olivia is sweet, hardworking and determined. She’s on a mission to not only save her family’s company but make it better. Imagine her surprise when Devon is the one to present her with an opportunity to do just that. Their relationship had ended less than amicably and she always regretted it. With walls built high around her heart Olivia excepts Devon’s offer and travels to Blueberry Springs. Things start to get crazy as protesters attack every chance they get. Trying to win over the hearts and minds of the people in Blueberry Springs and dispel the negative PR Olivia and Devon suddenly find themselves engaged. Will this fake engagement end up destroying both their careers and leave them both still heartbroken...or will it help them to overcome the past? Allowing them to heal and mend the broken pieces. Will it rekindled the love they once had for each other? This is such a good book. I am so glad to see the author start a new series in Blueberry Springs. It is so wonderful to catch up with some of the characters tears I her previous books. In this book Devon Mattson is trying to get Olivia Carrington to talk to him about a plant he thinks she can use for her new cosmetic line that is all natural and won’t hurt women. Unfortunately they had a bad break up in college and haven’t talked for ten years. They both have been trying to get over the other. He finally breaks into a meeting her company is having at a retreat and is able to talk to her. She comes to Blueberry Springs to see what Devon is talking about. This starts a precarious relationship.There are many variable affecting their relationship. There is a mayor race going on that Devon is in. The current mayor does not play well. There are protestors regarding a dam that may be put in the town. Olivia had an old family friend that is ready to propose to her, and so much more. I just loved the book and how I felt a part of the town. I was so happy to see Devon and Olivia talking again and learning to trust again. It was heart wrenching finding out what happened to the two that broke them up. I strongly encourage you to read the book. I was given a copy of the book to read. This a second chance love story. I like Blueberry Springs as a setting and, basically, all the characters from other books of the series. Devon and Olivia met at university. They fell in love. Olivia got pregnant, Devon proposed but she, being weak, left him to be with her rich family (they own a big make-up Company). Then She lost the baby. Ten years later they meet again.Devon is laid back and fun. He is a good man. He loves his family, he is liked by people. He is committed to ensuring his town welfare. He needs Olivia Company to save Blueberry Springs, but he doesn't trust her, justly.Olivia is stuck up, manipulative yet indecisive. She makes a lot of bad choices. She still loves Devon, sure, but until the last moment, she is conflicted between him and her family. I didn't like her at all. Hence the three stars. Devon and Olivia dated while they were in college. After a bad breakup, they didn’t see each other until 10 years later. Devon is running for mayor of the small town of Blueberry Springs. Olivia is working in her family’s cosmetic business. They each have something that will help the other’s career. Can they put aside the bad feelings that resulted from their breakup and work together?I thoroughly enjoyed The Surprise Wedding. This book had two of my favorite things. A second chance romance set in a small town. I recommend The Surprise Wedding to anyone who enjoys a good second chance romance. This is the continued story of Devon and Olivia 10 years later....if you want the back story read the prequel...The Promise.When these two meet up again Devon is trying to save his hometown of Blueberry Springs and believes that he has the secret ingredient Olivia needs to make her family's cosmetics all natural...but will they be able to keep it strictly business or will the feelings that both thought they were over...come back from deep in their hearts?? ?Another great read by Jean Oram. Love, love, LOVE! So happy to see Devon get his story - and I enjoyed finding out what had happened in his past. Olivia is a great character and it was great fun watching the two of them find their footing around each other. The town of Blueberry Springs shines again! Can't wait to read the rest of the series!!! 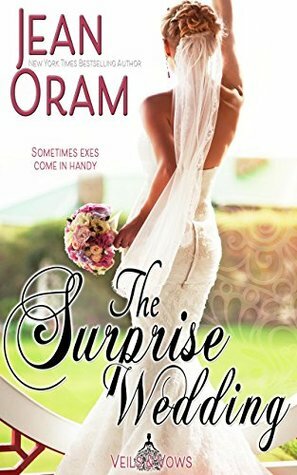 "The Surprise Wedding" (Veils and Vows Book 1) by Jean Oram is a great read. I loved reading more of Devon and Olivia's story. It's always entertaining in Blueberry Springs. This story has romance, humor, second chances, quirky characters, and more. Looking forward to reading what happens next in this new series. Highly recommend to all fans of romance. Really enjoyed it. Love interrupted by life and assumptions but true love never dies. Brought together over mutual interests turns into so much more. Loved Blueberry Springs and loving this spinoff series. I received a free copy of this book via Booksprout and am voluntarily leaving a review.Great story and great detail is taken to draw the town of Blueberry Springs and the people in it for you. I felt like I was there, and living thru the annoyance, pain and forgiveness between Devon and Olivia. Wonderfully written storyline that pulled me right into the story from the very beginning and the well developed characters kept me totally enthralled until the very end!I voluntarily reviewed an advanced reader copy of this book. I received a free copy of this book via Booksprout and am voluntarily leaving a review...Great Read,lovely,sweet and enjoyable second chance romance,great book to start the series,well written with lovely characters..loved it! thumbs up to you Ms.Jean! A sweet and enjoyable read. Bonus with seeing more of Blueberry Springs, and the stories from that world already. This was a super fun story to read. I enjoyed the story line and the characters. I received a free copy of this book via Booksprout and am voluntarily leaving a review. Beautiful! !True life with a very big surprise happy ending, perfect!! Couldn't put it down till I finished it. I love this series!! 3.5Nice second chance contemporary romance. 1st book for 2018. Actually received this ARC from Booksprout for an honest review a while back but I have misplaced it so I am reading it now as my 1st 2018 book 😶Well what can I say, the title said it all. I did guess that the surprise wedding was for Devon and Olivia but was surprised by how the story fold out. A lot of drama, miscommunication and selfless givings. I am glad we got a happy ending because I was saddened at the end of The Promise.I am sorry I am not able to complete my ARC promise on Booksprout because of the Amazon review requirement. However, I would like to thank Jean for sharing this ARC with me. Well here we are again. Devin and Olivia are playing engaged to help each other. The problem is they ended update with broken hearts in the prequel so this arrangement isn't going to easy. She want to get the natural ingredients for her new skin care line and she needs Devin to help her. Devin is running for Mayor and nobody can see past his wild years. They both need each other's help without getting their hearts destroyed again. Another great book by Jean Oram and start to her new series. Such a strong start to a new series. We see Devon and Olivia 10 years after their breakup and events from the prequel, The Promise. The characters all feel very real and have insecurities and doubts. I had a hard time putting it down. Definitely one to be read!